If you are traveling in the Colorado area, whether flying into Denver or driving through the Rocky Mountain state, you should consider taking a few days to visit Rocky Mountain National Park in northern Colorado. The park was founded in 1915 to preserve and highlight the grandeur of the Colorado Rocky Mountains, and it has been and continues to be quite successful in its mission. The stunning mountainous landscape along with its high mountain peaks, 76 of which reach elevations of 12,000 feet or more offer an adventure for every visitor. There are over 350 miles of trails in the park and a huge variety of wildlife, offering visitors an outdoor playground throughout the year. Rocky Mountain National Park is easily accessible to visitors and locals alike from the city of Denver to the mountain towns in Summit County. One can access Rocky Mountain National Park from the west via U.S. 34 from Grand Lake, the largest glacial lake in the state of Colorado. 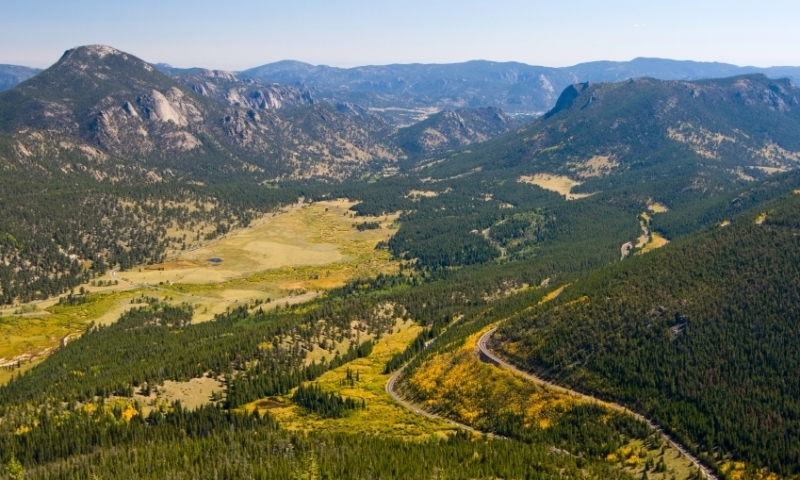 From the east access to the park is either from U.S. 34 or U.S. 36 from Estes Park, one of the most accessible mountain communities. There is no transportation available by air, rail or bus service directly to the park, however Amtrak serves nearby Granby, Colorado. Rental cars are available at the Granby Amtrak Station and tour operators provide scenic tours between Grand Lake and Estes Park. During the summer months, visitors are encouraged to leave their cars in the shuttle bus parking area. Free shuttle buses run frequently every day during the summer from Glacier Basin campground area to Bear Lake. During the peak of the summer, another bus runs from Moraine Park Campground to the Glacier Basin parking area. This route is great for day hikers since stops occur at several trailheads along Bear Lake Road. As the summer winds down, shuttles run only on weekends beginning mid-August through September. Rocky Mountain National Park is open year-round. As winter approaches and after the first heavy snowfall, the upper reaches of Trail Ridge Road are closed. This road crosses the Continental Divide, either from Grand Lake in the west, or from the Beaver Meadows or Fall River entrance stations in the east. It normally reopens by Memorial Day weekend.